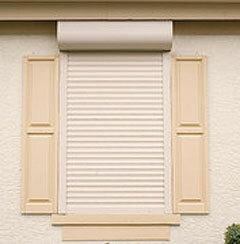 Croci's rolling shutters have been successfully tested to resist hurricane wind loads of up to 150 mph. Push button control with a Somfy RTS hand-held transmitter or Decora RTS wall switch will deploy your shutters in seconds. When closed, the shutters create a physical barrier from high winds and intruders. With Somfy's Chronis RTS timer you can automatically open and close your rolling shutters based on a pre-set time of day or randomly to give the impression of an occupied home. Laboratory tests performed on Croci's polyurethane rolling shutters indicate a reduction in noise and thermal insulation, resulting in reduced heating and cooling costs and noise pollution. 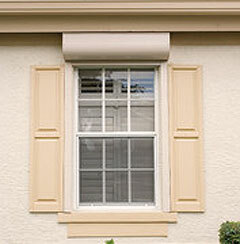 Installing Croci rolling shutters satisfy the latest safety and building code standards hurricane protection and in turn may be eligible to receive a discount from your insurance company. Croci motorized rolling shutters not only protect your family and home from hurricanes and threatening weather but also protect your furnishings from fading and damage caused by harmful UV rays. Croci rolling shutters and Somfy RTS motors make it convenient for you to open and close your rolling shutters with a variety of control options, such as hand-held transmitters, wireless wall switches and timers. Automated rolling shutters are dependable and can even be operated manually if a power failure occurs. With the simple touch of a button you can control the comfort and security of your home. Croci manufactures the highest quality rolling shutters which are custom made to your specifications, with scratch and corrosive resistant powder coating in colors that coordinate with your home.